It was an ironic coincidence that the same day the Knesset passed the updated, watered down NGO law, the US Senate Permanent Select Committee on Investigations published its final report on the Obama administration’s use of an Israeli registered NGO to run a campaign to bring down Prime Minister Binyamin Netanyahu in the 2015 elections. Hours after opposition leader Yitzhak Herzog hysterically and falsely alleged from the Knesset podium that “the blossoms of fascism are rising in Israeli society,” the Senate committee announced that the OneVoice organization unlawfully used US taxpayer money to conduct a political campaign to bring down Prime Minister Binyamin Netanyahu during the 2015 Knesset elections. In 2013-14, OneVoice received $465,000 from the State Department to conduct a campaign to raise domestic Israeli support for the State Department brokered peace process with the PLO. In December 2014, the Knesset called new elections. The same month, OneVoice merged with a new group called V-15 or Victory 2015. Together they led a campaign to unseat Netanyahu. OneVoice informed the State Department, through then consul general in Jerusalem Michael Ratner of its intentions. According to the Senate report, Ratner unlawfully deleted his communications with the group regarding its anti-Netanyahu campaign. To run the pro-peace process campaign, the State Department gave OneVoice funds to build data bases of Israeli voters, to train campaign cadres and to build a major online presence. OneVoice used these US-financed resources for its campaign to overthrow Netanyahu in contravention of US law. From the perspective of the Israeli public, the Senate report is illuminating for two reasons. 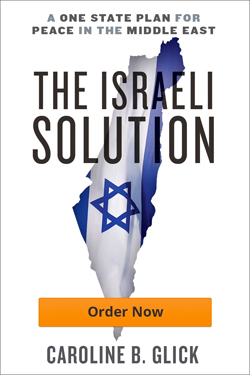 First, it reveals the true nature of the crisis in Israel’s relations with the US. Second, it demonstrated how foreign government funded Israeli registered NGOs harm the country. From the outset of Barack Obama’s presidency, which has overlapped Netanyahu’s tenure as prime minister, the Left’s central argument against Netanyahu has been that he upended Israel’s alliance with the US. The Senate report shows that this claim is a lie. The Senate report shows that the Obama administration has used the Israeli Left as its agent to advance its Israel policy – a policy that the Israeli public rejected in three successive elections. That policy requires Israel to renounce its rights to Judea, Samaria and united Jerusalem and cede those territories to the PLO. After the Obama administration mediated peace talks failed, the administration’s leftist Israeli agents used the resources the US paid for to wage a massively funded campaign to demonize with the aim of unseating Netanyahu in the general elections. In other words, the Israeli Left, which warns about a breach with Washington, has been the main beneficiary and a partner in facilitating and expanding this breach. To the extent that Netanyahu shoulders any responsibility for this state of affairs, he is responsible for his failure to rein in the Left or call it out for its anti-democratic behavior. And this brings us to the uproar the Left raised at the Knesset Tuesday against the updated NGO law. The updated law does nothing to stop this sort of subversion by foreign governments working with the Left. All it does is require foreign government funded Israeli registered organizations to note that they are funded by foreign governments on their official communications. So what is behind their uproar? To understand, it is first necessary to understand how foreign government funding of Israeli registered groups harms Israel. Understanding the nature of the damage also points to the direction the Knesset must go to repair the damage. Israel is harmed by these relationships in three ways. The first two are apparent in the OneVoice story. First, they harm Israel’s public discourse and through it, our democracy. OneVoice/V-15 based their US-funded and directed campaigns on the central claim that they were grassroots groups of regular Israelis that felt the time had come to stand up and be counted. In other words, they claimed they were the silent majority. Variations of this claim of native authenticity stand at the root of all the operations of foreign funded NGOs. As the Senate investigation showed, in the case of OneVoice, this claim was entirely fraudulent. It is also a fraud when staked out by the likes of B’tselem, Peace Now, Yesh Din, Breaking the Silence and dozens of other groups, which receive the bulk of their funding from foreign governments. If it weren’t for their foreign funders, they wouldn’t be doing what they are doing. By presenting themselves as grassroots Israeli voices, when in fact they are paid representatives of foreign governments who act to advance the interests of those governments in Israel, these groups distort the domestic discourse. We think we are talking to Israelis, who are invested in the future of this country. But we are actually talking to Europeans and Americans whose loyalty is not to Israel and its future and indeed is often hostile to Israel. The Israelis we face are not independent actors. They are paid contractors of foreign powers. This brings us to the second type of damage that these groups cause Israel. They facilitate the West’s anti-Israel policies. Anti-Israel governments need to sell their hostile policies to their electorates. They need to fund them. To do so, they need to build and maintain domestic support for their political war against the Jewish state. To secure this support, these government quote the findings of studies that they paid their Israeli-registered NGO’s to carry out for them. So not only does foreign government sponsorship of Israeli-registered NGOs harm Israel’s democratic order. It causes massive damage to Israel’s ability to defend itself abroad. The last way that foreign government funded NGOs harm Israel isn’t reflected in the OneVoice example. But it is reflected in the action of hundreds of other NGOs funded by foreign governments, every day. Foreign governments use Israeli registered NGOs to gum up the works of the Israeli judicial system to impede the operations of the entire government. And they do this deliberately. Take the Norwegian Refugee Council for instance. According to a recent report by NGO Monitor, between 2011 and 2013, the Norwegian government funded NRC gave Israeli and Palestinian groups $20 million to file lawsuits against the Israeli government in Israeli courts. During that period, the sponsored groups – among them Yesh Din and the Public Committee against House Demolition – filed 677 suits in local courts and the Supreme Court. To sum up then, foreign governments work through Israeli-registered NGOs to harm Israel by weakening its democracy, obstructing and weakening its justice system and weakening its international position. And against these damaging operations, all the Knesset has done to date is require these groups to mention they are funded by foreign governments on their official communications. In other words, the Knesset has so far failed to deal with this large and growing problem. To repair the actual damage, rather than go through the motions, the Knesset needs to pass three new laws. First, we need to have a full picture of the relationships between these groups and their foreign funders. Who initiates their projects? Who oversees them? What does the Norwegian Ambassador tell B’tselem’s Director when he hands her the monthly check? In January, Ad Kan revealed that Breaking the Silence gathered information about IDF weapons systems, tactics and troop movements from reservists. Who tasked the “Israeli” organization to do so? Once the public knows the answers to these questions, these groups’ ability to distort the public debate and so harm our democracy will be vastly curtailed. To this end, the Knesset must pass a law requiring groups that receive funding from foreign governments to report the contents of all of their communications with those governments. Europeans governments refuse to divulge the details of their relationships with these groups. And as the State Department’s deletion of its emails to OneVoice makes clear, the US does as well. The reason for their secrecy is obvious. The purpose of their relationships with these groups is subversion. OneVoice used a resource – a voter database – whose creation was financed by the US government. When native Israeli V-15 workers knocked on voters’ doors and urged them to bring down Netanyahu, it would have been useful for the public to know that those campaign workers were trained on the US taxpayers’ dime, and that they knew its addresses because the State Department paid for V-15’s voter rolls. The Knesset must pass a law requiring all groups that use resources in their work that have been funded by foreign governments to report the foreign origin or ownership of those resources. Finally, there is the lawfare issue. The government is sued by foreign government funded Israeli registered NGOs nearly every day. The lawsuits are only made possible and often directed by those governments. Their objective is to prevent the smooth functioning of the government and legal system. The Knesset should pass a law that requires foreign governments that fund lawsuits through NGOs to be identified as parties to those lawsuits in court documents. So too, foreign governments that sue the government should be required to pay court costs. Foreign states have chosen to use undiplomatic means to influence government policies. The Knesset needs to make sure that these means are brought out in the open so we can know what we’re dealing with. This finally returns us to Herzog and his fellow leftists, and their unhinged, libelous response to the passage of the toothless NGO law this week. Those libels were part of an ongoing campaign by Herzog and his comrades to delegitimize the government and Israeli society as a whole as an illegitimate gang of brownshirts in training. Now that we understand the collaborative relations between the Left and foreign governments, we realize that these statements are part of the deal. Herzog and his colleagues, who benefit from these subversive operations by foreign governments, help them along in their efforts to delegitimize the country. The time has come to put an end to this travesty. As the Left showed on Tuesday, yet again, it has no intention of cleaning up its act. Subversion is the only card it has left. To save our democracy, the Knesset needs to stop beating around the bush and get to work.